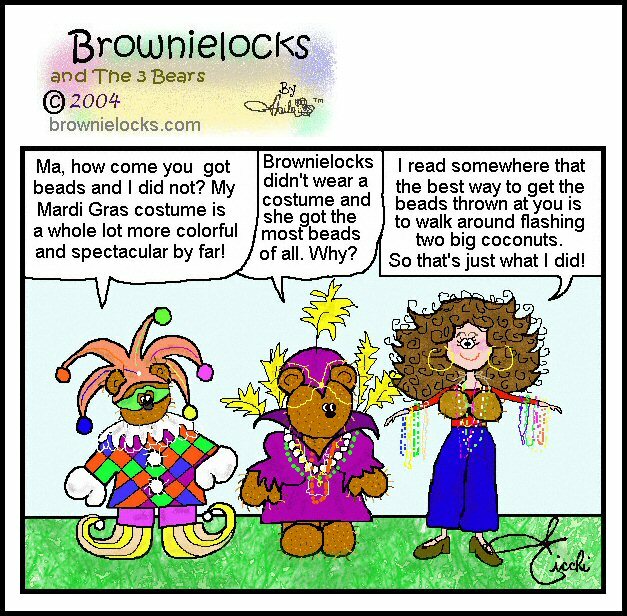 But, the beginning of Mardi Gras will vary from year to year. The season was commonly called Carnival to early Christians. The period went from the Epiphany (January 6) to Shrove Tuesday (the day before Lent). In Latin, carne vale means "farewell to meat." However, some feel it has a broader meaning and interpret it as a reference to more carnal pleasures that are forbidden during the 40 days during Lent. Carnival is a time for feasting and self-indulgence. The heaviest partying is done the last 3 days before Ash Wednesday, particularly on Shrove Tuesday. Mardi Gras or Carnival features masked balls, lavish costumes, floats, parades, torchlight processions, dancing, fireworks and feasting on all sorts of foods (usually those that are given up during Lent). Ironically, in earlier times, the pagan spring festivals (to help insure the growth of crops) involved much the same sort of celebrations of processions, feastings and masquerades. It is said that most of the Mardi Gras or Carnival traditions go back to the 14th century. One of the most famous carnival celebrations in the world is in Rio de Janeiro, Brazil. The costume balls, pageants, parades and feasting goes on for four days, with the highlight being the parade of the samba schools (on the Sunday & Monday preceding Ash Wednesday). This is taken very seriously. People spend months prior making costumes and learning special dances for this parade. The competition is fierce! In the United States, the most famous Carnival takes place in New Orleans, Louisiana. It takes place two weeks prior to Ash Wednesday. In New Orleans, the Carnival is called the Mardi Gras, which mean "Fat Tuesday" by the early French settlers. They named it that because the day before the start of Lent was when you just pigged out on all the fat products in the house! People ate up all the milk, butter, eggs and anything else in the kitchen before the start of Lent. Mardi Gras peaks with a series of parades organized by a group called the Krewes (see below). The Mardi Gras parade attracts over a million spectators every year. This time is very important for Roman Catholics. In European countries where Rome had the greatest influence (i.e. Italy, Spain, France), a popular feature is the Carnival King. This is a burlesque figure often made out of straw, who reigns over the festivities. When it's all over, the king is usually shot, burnt or drowned in public, while onlookers cheer. This is said to be a symbolic act to rid the spectators of their sinfulness and folly. One belief is that the Carnival King is a direct descendant of the old King of the Saturnalia, the ancient Roman festival held in December. This pagan king was chosen to impersonate the Roman agricultural god, Saturn, during the celebration; but at the end he suffered a real death instead of a make-believe one today. Eventually, the custom of putting a fake king to death faded away over time. But, the idea of appointing someone to reign over the festivities has survived in the form of the Carnival King. Although Mardi Gras is very colorful, the official colors of the event are: Purple, Green and Gold. It is believed that these were declared in 1872 by Rex, King of the Carnival. Why those colors? Pope Benedict XIV in 1748 tried to encourage Christians to make up for their excessively bad behavior during Carnival by instituting a special devotion for 3 days before Lent. He called it "Forty Hours of Carnival" and it is still held in many European and American churches today where carnival celebrations are a long-standing tradition. All day Monday and Tuesday, the Blessed Sacrament is exposed and devotions are held in the evening. Most Carnival and Mardi Gras celebrations include fried dough in some form. In New Orleans, they feature the beignet. This is a square doughnut without a hole, somewhat like a fritter. In Germany the Carnival is called Fastnacht, the fried dough is served as Fastnachtkuchen, which was later brought to the United States by German immigrants who settled in Pennsylvania. These fried cakes can be found in many German settled areas today. As I mentioned before, it was the custom on Fat Tuesday to use up all the fat in the house prior to Lent, these fried dough helped use up all the fat so it wouldn't go to waste. They also have small dolls (or a bean) hidden inside these cakes. Whoever gets the piece with the doll (or bean) is crowned King for a day. In New Orleans, the Carnival begins with the King's Ball or Bal du Roi. And, a Parisian tradition says that whoever gets the doll has to hold the next ball. These balls go on all season, with the final one held on Mardi Gras. These are private clubs that give parties, parades and balls during Mardi Gras season. The Kewes can be traced back to Mobile, Alabama in 1831. A man named Michael Krafft had been out celebrating New Year's Eve with friends when they decided to break into a hardware store. They stole cowbells and rakes and then paraded through the streets making as much noise as they could. This lead to the creation of the Cowbellion de Rakin Society. This group organized a rowdy costume parade the following year featuring tableaux and dancing. In 1857, six men from Mobile and members of the Society moved to New Orleans. They decided to introduce a similar organization there. They did, and named it the Mystick Kewe of Comus. Doesn't make much sense to you? This was a reference to the masque (a dramatic entertainment featuring elaborate costumes, scenery, music and dancing) called Comus written by English poet John Milton; and, to the Greek and Roman god of revelry, feasting and nocturnal entertainment. The word Krewe is said to come from the Anglo-Saxon spelling of "crew." There are also "maverick" krewes whose memberships are open to anyone who can pay the required fee to join. The floats are designed by the krewes and range from very traditional (these are small, delicate floats with a lot of ornamental sculptures and an extreme use of gold and silver), to less formal floats that are merely decorated vans and trucks. Some feel that the kewes and their parades go back to the reynages of medieval France. These were make-believe kingdoms established as part of the Carnival celebration. It is also believed that the floats seen in the Mardi Gras parades were derived from religious tableaux originally performed in churches, later removed outside when they got too rowdy. One theory regarding the origin of Mardi Gras (Fat Tuesday) is that it was named after the ritual of leading a fattened ox through the village streets before Lent. Afterwards it was slaughtered to provide the final meal before Lenten restrictions on meat and dairy products went into effect. In many French Carnival celebrations today, a fattened ox plays a central role. A child that is referred to as "the king of butchers" rides in a decorated car behind the ox and the people throw confetti or blow horns on the ox as the butcher passes by. Click our player to hear "Oh When The Saints Go Marching In!" Return to our February Monthly Celebrations Listing. Bead Divider Graphic from site offering public domain images. Author Unknown. Louisiana Gator Band also from site offering public domain animations. Author Unknown.